Last week a mother was prosecuted for letting her baby drown in the bath while she was down stairs drinking cider. Obviously, this was a one off and most mothers would not behave in this manner. However, it does remind us all just how dangerous it is to leave babies and young children in or by water. A child can drown in just 5 centimetres of water. This is because a very young child doesn’t know that they need to turn over or stand on their feet if they are submerged in water and so they try to breathe and take in the water. One of the nannies on our paediatric first aid course had a baby in the bath experience which sadly did not end well. Just one week after she had refreshed her paediatric first aid skills with us she arrived at her client’s house for a baby-sitting job to find that the baby, left unattended for a matter of seconds by the mother, had slipped under the water. The nanny immediately started CPR while the mother called 999. The baby was in ICU for one week but died. An inquest found that the nanny’s action was exemplary and she had performed CPR correctly and it was just a tragic accident. Sadly, drowning is the third most common cause of accidental death in children. We all live very busy lives juggling numerous tasks, especially mothers, and it is tempting to run downstairs to start dinner, answer the phone, or start clearing up the house and leave an older but still young child briefly to look after a younger sibling or at least raise the alarm if something goes wrong. 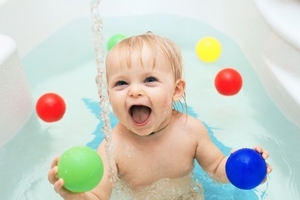 But older children should never be given the responsibility of looking after a younger brother or sister in the bath, as a two or three-year-old is not old enough to recognise danger or act appropriately. Of course, there will always be an unguarded moment – we cannot be there 24/7 but when it comes to water, babies and young children should never be left alone. Should the worst happen ALWAYS dial 999 or 112 for an ambulance, even if the child appears to recover from a drowning episode. A tiny amount of water in the lungs can cause a delayed reaction of sudden and severe breathing difficulty and can be fatal even 24 hours after the incident. This is called secondary drowning. Why does this happen? If enough water is inhaled, then it can wash away the chemical (surfactant) which keeps part of the lungs (alveoli) open. Without this surfactant, the lungs begin to collapse. Then the body’s own fluids as well as those swallowed/inhaled can seep into the lungs. This prevents oxygen and carbon dioxide from being exchanged and effectively causes the patient to drown. This can occur much later than the initial incident and without any more fluid being inhaled.